The A&E show Storage Wars, spin off Storage Wars: Texas and copycat shows have a lot more people thinking about buying storage lockers at auction than in years past. The thrill of the bidding and the promise of hidden treasure in boxes and drawers gets many people excited. In a bad economy storage unit auctions should be big business as people can no longer afford to pay to store their extra stuff. However, before quitting your day job and jumping into auctions full-time, there are a number of important things to consider about the mini-storage unit auction business. Mini-storage companies have become pretty efficient at collecting rent. Through credit card deductions, automatic debit, followup emails and prepaid units there are far fewer abandoned storage units than the TV shows imply. e what looks like a long auction list could quickly become a no auction list and a wasted tank of gas. There may be many more bidders at the auctions than storage units to bid on. This can lead to serious competition, as seen on Storage Wars. Prices can go much higher than the junk inside is worth. Be prepared to go home empty-handed because some fool or genius decided to bid much higher than you felt the auctioned storage locker was worth. Buying storage lockers can really be a gamble. Many will have unmarked or falsely marked boxes in them. That big screen TV box might actually hold a TV but it might just as well be stuffed with worthless wire coat hangers or even be totally empty. While the stars of Storage Wars find unique and valuable hidden treasure tucked into dresser drawers and trunks, this is the exception, not the rule. If there is anything hidden away it might be old underwear rather than gold chains. What you can not see is going to be a big surprise. Another challenge is that you will not have time to properly research what you can see. Unless you have years of experience handling used goods you will not really know what used furniture, records or business equipment will really bring in the market. Even the experts on Storage Wars are often guessing at what items will resell for, and they have been buying and selling used goods for years. To actually realize on the value of collectables, you are going to need a network of experts to call on. Unfortunately no one really knows which expert you will need in advance, so you can't really pre-plan your expert network. Instead, for each locker you will need to be prepared to research online and make calls to identify the right person to have evaluate that old riding gear or crystal glasses. Often, the items that look valuable turn out to be duds and all your searching for the right expert ends in a big goose egg anyway. Items can be fake, broken, or otherwise worthless. While Storage Wars shows the guys finding worthless items sometimes, if they showed the true ratio of duds to winners no one would watch the show because it would be too boring. So you bought a storage locker - now what to do with all the stuff before you get it sold? This business will quickly plug up your garage with unsold stuff. You could rent the storage locker the stuff sits in, but do that a few times and pretty soon you have lockers of stuff all over the state and you will find yourself running from place to place to pickup and sell items. The answer to the storage challenges is likely going to be a small warehouse or store near your home base. You will need a truck to move all the stuff from wherever you bought it to your home base too. You will also need some helping hands unless you can move furniture all by yourself. None of these costs are calculated in the onscreen Storage Wars profits. The treasures are going to surrounded with trash and trash costs money to dispose of. Wherever you go to buy self storage units you will need to pay a costly visit to the local dump. Also expect to separate out recyclable items for proper disposal. If you hate cleaning up your own garage or basement, cleaning up other people's junk is even less fun. The abandoned locker business takes cash, not just to buy the lockers but for travel, transport, trash disposal, labor, and warehouse space. Budget for some mistakes too because some lockers will lose money. Treat it like a real business that you will need to fund properly for success. If the renter of the storage unit could easily sell off the stuff or it was really valuable, the owner of the stuff would sell everything to raise cash. These owners might just leave behind junk and empty boxes to avoid the trash disposal costs. Some lockers might be abandoned because the owner moved far away, died, or otherwise became unable to deal with the stuff in the locker, and these are the lockers that have better potential. Should You Buy Abandoned Storage Lockers? Since the disposition of goods is even tougher than the acquisition of storage lockers, perhaps the best way to test the business is to go through your own basement, garage and book shelves for excess stuff you are not using. Sell off everything you don't use and see how difficult this is and what you can actually get for your stuff. This process will teach you how to get rid of miscellaneous used stuff, give you a reality check about what stuff actually sells for, make room for new purchases, and raise some working capital. Even better, selling off your own excess stuff is risk free because it requires no cash out of pocket. 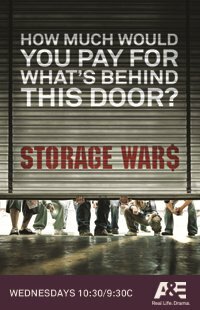 You might also consider buying the whole series of Storage Wars eposides on Amazon Instant Video and than watching them carefully for not only the obvious, but the less obvious clues on how to do the storage auction business. Dealing in mini storage units has the potential to be a profitable business but before you dive in be aware of all the associated challenges and costs involved with buying storage lockers. Don't think this would be an option in the UK. I enjoyed your article however, because it is something I had not really thought about. Some research showed me that there are storage unit auctions in the UK but it is much less common than in the USA. Also I believe storage auction in Canada are less common. It is a cultural thing - in the US many people think nothing of leaving town and forgetting their obligations.